Last night it was announced that /star-wars-anthology-director-josh-trank/Josh Trank exited the second Star Wars spinoff after making a 'personal decision' that the project just wasn't right for him. Now, a new report claims that his behavior on the set of the upcoming Fantastic Four reboot is actually what led to him being fired by Lucasfilm and Disney. Apparently, his unusual conduct on the set of that film, which opens this August, alarmed LucasFilm executives, and they felt he couldn't be trusted with the second Untitled Star Wars Anthology Movie. 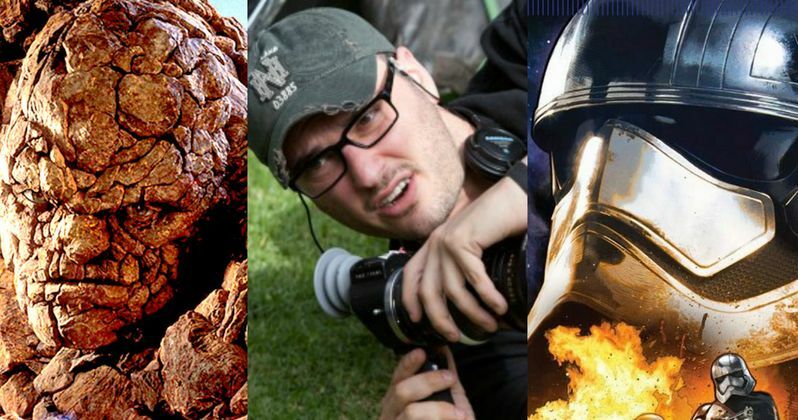 Questions began to arise when Josh Trank, who is 30, did not show up for his planned appearance at this year's Star Wars Celebration. At the time, both the director and Disney claimed he was suffering from the flu. Insiders say that Disney asked him not to attend as they tried to figure out how best to move forward with Josh Trank, as they set out to build a new universe of Star Wars movies. At the time, they were undecided about his firing. "[We're] very happy with the movie and we can't wait for audiences to see it. There were definitely some bumps in the road." During production, Josh Trank left several small dogs in a rented New Orleans home, where they caused $100,000 worth of damages to the property. A source says the studio considers the property damage to be the sole responsibility of the director. It is speculated that, while Josh Trank proved his talents with 2012's well-received fount footage superhero adventure Chronicle, he does not yet have the skills to handle himself when it comes to a big production. He is often described as 'indecisive' and 'uncommunicative'. When it comes to Fantastic Four, it is stated that producers Simon Kinberg and Hutch Parker had to help pull the movie together, though Josh Trank remained on set and was directing the film. The movie has gone through a number of reshoots, the most recent of which were difficult to make happen due to the cast's prior commitments on other projects. Three days of reshoots just happened this past April, with Miles Teller having to shoot on weekends while he worked on Arms & the Dudes the rest of the week. Both Simon Kinberg and Hutch Parker are said to have been heavily involved with these reshoots, which pulled them away from prepping their next superhero adventure, X-Men: Apocalypse, which is now shooting in Canada. Stephen E. Rivkin, known for his work on Avatar, has been brought in to help finish the movie. Simon Kinberg is also producing the second Untitled Star Wars Anthology Movie. He is said to have complained to producer Kathleen Kennedy and the LucasFilm team about Josh Trank's problems during the Fantastic Four shoot. As the Star Wars team began to hear some of the stories, they rapidly became less confident in handing over such an important film to the director. Now, having parted ways, the studio is currently seeking out someone new to take over the project, with the film still moving forward. At this time Disney has refused to commit.